For mixed martial arts fans, the checkerboard pattern of Croatia is commonly associated with one man: the legendary Mirko Cro Cop. While he may be the most commonly known Croatian fighter, the small nation of just over four billion has a rich tradition in producing fighters that have reached the top level of their craft. From the storied kickboxers Stefan Leko and Branko Cikatic to former UFC fighters Igor Pokrajac and Goran Reljic, it’s easy to see the deep roots of Croatian mixed martial arts. But the man who dons the checkerboard shorts today in the octagon is not one from Croatia, rather, he hails from Cleveland, Ohio. 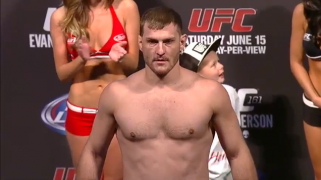 Of course, I am talking about UFC on Fox 10 co-main event headliner Stipe Miocic. While Stipe only has ten fights on his record, he is fast becoming one of the most talked about fighters in the heavyweight division. With his varied, combination oriented striking and his ability to gain dominant position in the clinch, Miocic is an extremely well rounded fighter that seems to improve with every fight. Now, we will take a look at these fights, to see how Miocic has climbed the ranks of the heavyweight division. You could only pick a few fighters that would be a tougher test for an up and coming heavyweight than Joey Beltran. While Beltran was never a bastion of technique, he always would give punishment while being able to take massive amounts in return. Stipe was gifted just that kind of fight in his debut. However, it wasn’t at all that kind of fight in the first round. Miocic quickly established his range and crisply outboxed the hapless Beltran and cruised his way through the first five minutes of his UFC career. The second round was a different story altogether, though, as Beltran came out of his corner with bad intentions. The “Mexicutioner” turned the fight into an all out brawl swiftly, and sucked Miocic right into his style of fighting. Both fighters were able to land big punches, and it was unclear who actually won the round. The third round was where Miocic was able to separate himself from many other UFC rookies. He did not fold under pressure and did not begin to brawl Beltran once more, instead opting to grapple with Beltran. This proved to be a wise move, as he totally outclassed Joey in this department, convincingly winning the third round and earning a unanimous decision victory. With his UFC debut, Miocic got all he could handle from a very game, though inferior, opponent, and showed the division that he had great potential to challenge some of the top fighters in the class. Miocic’s next test was against the submission oriented Phil De Fries, who was also making his second UFC appearance. It was a fight that was a certain clash of styles, as De Fries was one who loved to take the fight to the ground and hunt for a submission, while Miocic wanted to outbox his opponent. 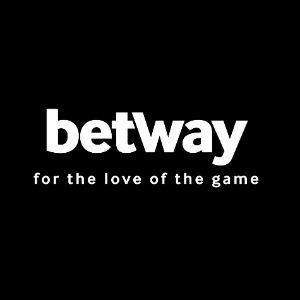 While at the time the fight made matchmaking sense, as soon as it got underway it was clear that it was a mismatch. De Fries spent no time feeling out Stipe and instead opted to throw slow, looping punches and paid for it dearly, as Miocic stopped him in just over forty seconds with a perfectly placed counter right hand. Stipe once again was able to showcase the boxing skills that earned him his 2009 Golden Gloves championship, and continued to climb the ladder in the heavyweight division. Stipe’s next fight was against the late Shane Del Rosario, who at the time was also an undefeated up and comer in the division. Del Rosario, a former Muay Thai champion, was a Strikeforce product that had finished all three fights in the promotion by way of first round finishes. The match-up was excellent matchmaking- two undefeated, exciting, well rounded fighters would battle to see who would take the next step in their career. The first round was one dominated by the leg kicks of Shane Del Rosario, who showed a very effective Muay Thai gameplan that involved devastating kicks to the body from the southpaw stance. While Miocic was able to put together some good 1-2 combinations, it was clear that Del Rosario was getting the better of the stand up. The end of the round would be a clue as to what would play out, as Miocic was able to take down Del Rosario and land a little ground and pound before the bell rang. In the second round, Del Rosario continued with his kicks before Stipe was able to take him to the ground. From here, Miocic was able to demonstrate yet another facet of his game- his excellent top control. Despite some decent sweep attempts from Shane and multiple transitions, Stipe was able to maintain dominant position and in this position landed multiple punishing blows that eventually put an end to the undefeated career of Shane Del Rosario via referee stoppage. It was an impressive win for Miocic, as he was able to overcome adversity in what would be his area of comfort and take the fight to the ground, where he showcased his NCAA Division I wrestling by controlling Del Rosario on the ground and finishing the fight. 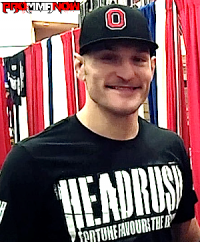 Miocic was granted a main event fight in his fourth UFC appearance versus the dangerous Dutch kickboxer Stefan Struve. “The Skyscraper”, a UFC veteran, was on a three fight winning streak, using both jiu jitsu and kickboxing to power his way back into the top ten of the division. The fight was a real benchmark for Miocic- would he be able to defeat a fighter of Struve’s caliber? In the first round, it appeared so, as Stipe was able to expertly work the body of Struve and avoid the seven footer’s long straight punches. The second round, though, saw Struve find his range with the jab, something Struve has consistently struggled with throughout his career. Utilizing his 84.5 inch reach, Struve was able to land some powerful straight punches coupled with some devastating uppercuts en route to a huge knockout win over Miocic. While he suffered his first loss, Stipe looked very game against The Skyscraper, in a fight that may have been Struve’s best performance to date. Due to multiple injuries, UFC 161 was essentially a dying card. Fewer and fewer big names were on the card, until Roy “Big Country” Nelson volunteered to step up and fight in a co-main event fight just six weeks after dispatching Cheick Kongo via knockout, his third first round knockout in a row. It was decided that Nelson would replace Soa Palelei, who was slated to fight Miocic. So, Miocic went from fighting someone in his UFC debut to fighting the then fifth ranked figher in the division, who was on a knockout binge. It turned out to be a blessing for Stipe, as he put on an absolute clinic against the out of shape and completely bewildered Nelson, who never even sniffed victory. Stipe utilized devastating straight punch combinations to batter Nelson and cruise to a huge unanimous decision victory. As such, this is where Stipe Miocic stands. Fresh off his decisive victory over Roy Nelson, he will look to overcome the resurging UFC veteran Gabriel Gonzaga in the co-main event of UFC on Fox 10 in what is sure to be a fantastic fight. It all goes down live from Chicago this Saturday night, where the main card begins at 8 pm EST.